Under the latest stage of a £1.5million investment programme, Concentric Pumps Limited has increased manufacturing capacity at its UK plant with the commissioning of a Kira CNC machining centre to form the core of a new dedicated manufacturing cell. The new machine is a Kira HPC-30Vb-2AQC high-speed, twin-pallet vertical machining centre providing virtually uninterrupted continuous production. It can change pallets in 2.4 seconds and tools in only 0.7 seconds, which is said to be the fastest in the industry. Traverse rate is 56m/min in all axes and spindle speed is 15000 RPM with fast acceleration and deceleration rates, giving a chip-to-chip time of 1.8 seconds. Control is via a Fanuc 21i-MB unit. Other features include an automatic door, auto clamping of the fixtures and air-sensing to prevent mis-loads. 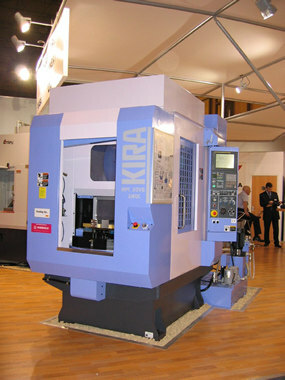 The Kira machine will be used in the manufacture of aluminium pump components for diesel engines. David Woolley, Managing Director of Concentric Pumps, commented: "We have a rolling programme of investments at all our plants, including Birmingham and have just opened a new factory in Pune, India. This reflects the continuing growth in demand from our partners around the world, including Cummins, Komatsu and BMC in Turkey."